Mushing over 1,000 miles in the frozen Alaska wilderness is no easy feat. At the Iditarod Awards Banquet in Nome, Alaska, the mood is one of excitement and accomplishment as rookies, veterans and fans of the Last Great Race pour into the Nome Recreation Center to celebrate the culmination of the 2016 Iditarod. It’s no secret who this year’s winner is. Musher Dallas Seavey arrived in Nome on March 15 completing the course in a record 8 days, 11 hours, 20 minutes and 16 seconds. 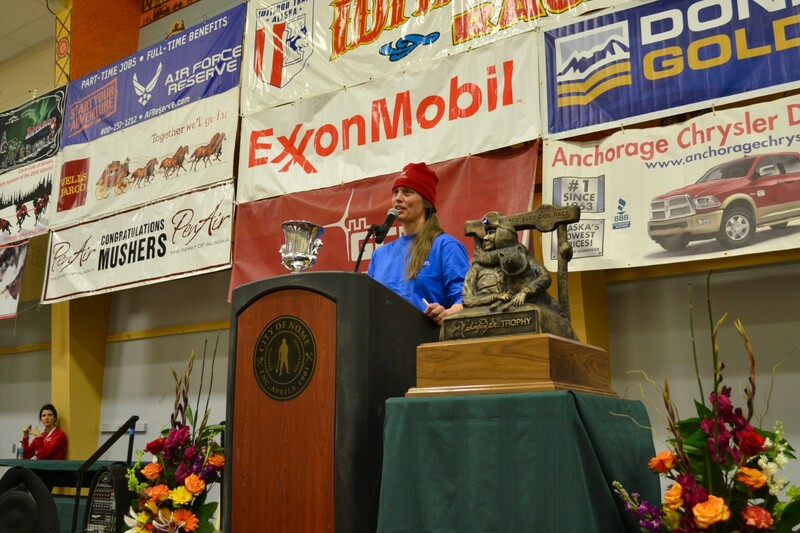 But what is still unknown as the mushers and fans settle into their seats, is who will receive another highly coveted honor – the Alaska Airlines Leonhard Seppala Humanitarian Award. While the Iditarod is at its core a competitive race, it is also a demonstration of the special bond between a musher and their dogs. The award recognizes a musher who takes outstanding care of their team along the trail and is presented each year by Alaska Airlines. The award is named after Leonhard Seppala, a highly-skilled musher who played a critical role in carrying diphtheria serum to Nome in 1925. The winner of the 2016 Alaska Airlines Leonhard Seppala Humanitarian Award is Aliy Zirkle of Two Rivers, Alaska. Winners are chosen by veterinarians that track the dogs’ health, performance and attitude throughout the race. Other than winning the Iditarod, most mushers and volunteers say the Leonhard Seppala award is the most meaningful. Zirkle was one of two mushers this year who were attacked by a man on a snow machine outside of the Nulato checkpoint. One of her dogs was injured in the attack. Despite the setback, she went on to finish the race in third place. This year’s banquet, however, held another surprise. Musher DeeDee Jonrowe, a 30-year veteran of the Iditarod trail and two-time winner of the Alaska Airlines Leonhard Seppala Humanitarian Award, lost her home in Willow, Alaska to a wildfire in June 2015. Jonrowe lost everything, except for her dogs – including her 1991 Leonhard Seppala Humanitarian Award. Alaska Airlines’ Regional Vice President Marilyn Romano presented her with a replacement trophy, a replica of her 1991 award. Jonrowe’s 2012 trophy is currently on display at the Smithsonian Museum in Washington, D.C., along with one of her signature pink race coats. Alaska Airlines has been a proud supporter of the Last Great Race for nearly 40 years. In addition to presenting Jonrowe with a replacement trophy, Alaska Airlines used its sponsorship of the Iditarod to give back in another way. Also in attendance at the Iditarod Awards Banquet in Nome was Remedy Carte, a brave and bubbly six-year-old who has been fighting brain cancer for most of her life. Carte was the Alaska Airlines IditaRider at the ceremonial start of the Last Great Race in Anchorage on March 5, riding in the sled of her favorite musher Al Eischens, who has been a friend of Carte’s family since before she was born. Carte’s family and friends put together a trip for her and her mother to see Eischens finish the Iditarod in Nome. To learn more about their story, click here.